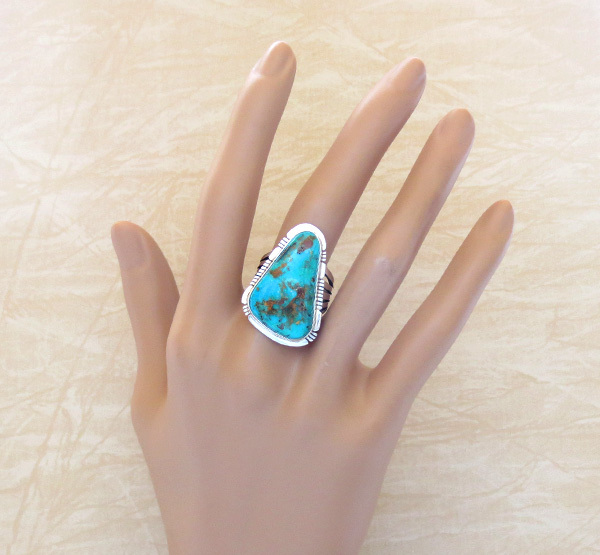 This beautiful large ring is a size 8 1/2 and was created by San Felipe Artist Philip Sanchez. 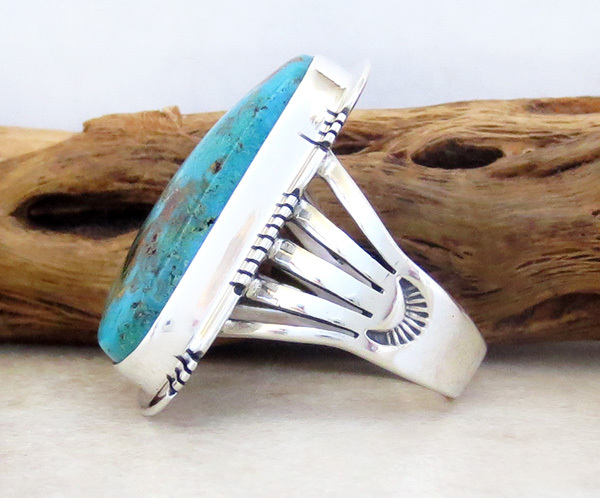 in a smooth bezel with a carved silver border. 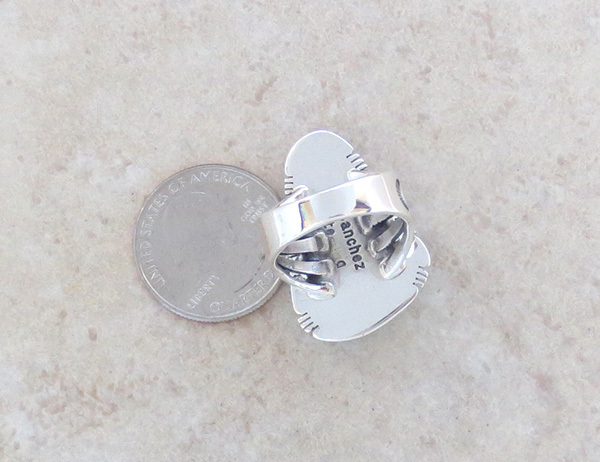 It measures 1 1/4" tall by 3/4" wide. weight: 12.8 grams on my scale. Philip Sanchez, San Felipe, was born in 1951 at the San Felipe Pueblo. He was raised on a large ranch with his 8 sisters and 5 brothers. They grew up tending to a variety of livestock and farming fresh fruits and vegetables. Philip stayed close to his roots with livestock of his own and enjoys horseback riding to check on livestock or just to go for a ride at sunset. 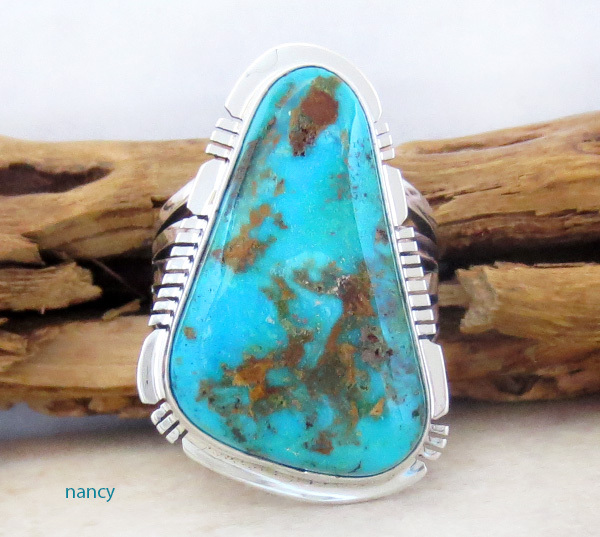 Philip's father made turquoise necklaces from natural nuggets to sell, but it was his older brother who got him interested in working with silver. It was in junior high that Philip started working with silver and learned the basics of jewelry making. Philip continued throughout high school to perfecting his technique. 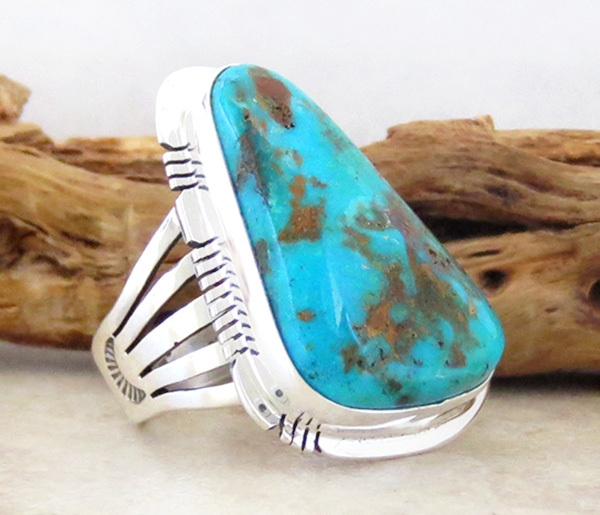 His brother and father instilled in him to always stay true to his culture which shows in his jewelry designs. He uses clouds and rain along with other symbols which can also be seen in pottery and baskets from his pueblo of San Felipe. Philip loves to travel and see different parts of the country and has traveled to Canada on several times. He likes to fish, hunt and just about any activity that gets him in the outdoors. Philip, also, speaks several different Native American pueblo dialects such as San Felipe, Santo Domingo, Acoma, Zia, Laguna and Cochiti.